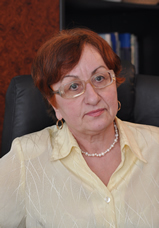 She graduated in 1971 the Faculty of Law from the Babes - Bolyai University, Cluj Napoca. Since graduating, she worked only as a lawyer, and she has accumulated many years of experience, many before 1989, when most lawyers worked with all range of causes, from all areas of law. After 1989 she continued to work in all areas of civil law, especially property rights, legal liability, commercial law, family law, labor law, and criminal law. Over time, in Arad there were many “big lawyers”, highly professional, who made ​​history in Arad Bar, which we remember with great respect and gratitude, because they formed us. They were our great masters. We like to think our turn came and I reached this level. I trained ​​many young lawyers, who, without exception, are now very good lawyers or magistrates. I never accepted young lawyers insufficiently prepared, because we repulse imposture. He is PhD in economics having the doctoral thesis "Risk and risk management in market economy." He graduated the Faculty of Law in 2006, among the best students of the series. He was admitted the first to the Arad Bar in 2007, with the average grade 9.40. 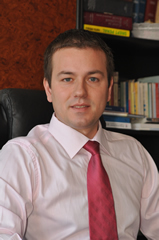 He also graduated in 2002 the Faculty of Economics, West University of Timisoara, Department of International Transactions. Since graduating from the university he worked as an economist, in the economic consultancy, tax, and accounting. He graduated high school at National College “Moise Nicoara” of Arad in 1998. After joining the Bar Arad, the main legal areas covered are: commercial law, corporate law, fiscal law, administrative law, labor law, civil law, criminal law. We have partners and collaborators reputed specialists in other fields. We work constantly with Ciprian Bornea, who is a Expert Accountant, member of the Body of Expert Accountants and Authorized Accountants from Romania (CECCAR). He also graduated the Faculty of Law.